Ideal for the mining, oil and gas industry. 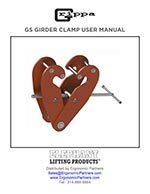 Ergonomic Partners provides heavy duty beam clamps and girder clamps for harsh industrial environments including: Oil and Gas, Marine, Steel Mills, Mining, General Fabrication, Construction, and Industrial Maintenance. 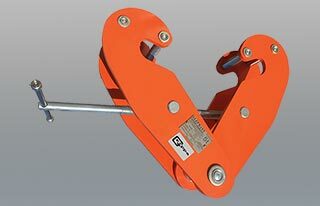 The heavy duty beam clamps have unusually high capacities of 20 ton and 32 ton to handle the extreme lifting capacities. Designed for the harsh oil, gas and mining environments. Pin type GS series is standard stock. Robust steel construction. High quality paint finish. Handle beams from 2.9" to 36" in width. GS-2 2 mt 2.9-9.8 in. 9.8 in. 2.5 in. GS-3 3 mt 3.3-11.8 in. 11.8 in. 2.8 in. GS-5 5 mt 4.7-16.9 in. 16.9 in. 3.3 in. GS-10 10 mt 7.8-17.7 in. 17.7 in. 4.1 in. GS-20 20 mt 7.8-18.9 in. 18.9 in. 4.7 in. GS-32 32 mt 9.0-30 in. 30 in. 9 in. GS-32-36 32 mt 9.0-36 in. 36.3 in. 9 in. 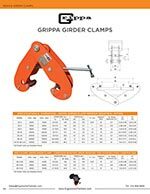 100% Stainless Steel Grippa Beam Clamp Specs. GS-2-SS 2 mt 2.9-9.8 in. 9.8 in. 2.5 in. GS-3-SS 3 mt 3.3-11.8 in. 11.8 in. 2.8 in. GS-5-SS 5 mt 4.7-16.10 in. 16.9 in. 3.4 in. Not In Stock. Available Upon Request. 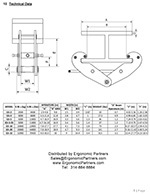 Ergonomic Partners is a distributor for heavy duty beam clamps; serving clients from coast to coast, Canada, Mexico and especially focused in the states of Missouri, Illinois, Indiana, Kansas, Arkansas, Mississippi, Nebraska, Tennessee, Kentucky, Iowa, and Oklahoma.